With over 600 attendees, this was an exciting conference on many fronts! 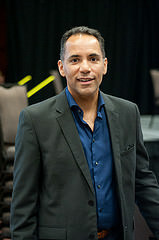 Our Keynote speaker, Tim Hague, winner of The Amazing Race Canada, spoke about his Parkinson's journey with candor. He earned a standing ovation from a very moved and inspired crowd. Other presentations included Dr. John Stoessl's The Placebo Effect, Dr. Laurie Mischley's Diet, Nutrition and the Future of PD and social worker Bartja Wachtel's Wiring Well Being. The audience also enjoyed a music therapy demonstration by Megumi Azekawa and the Gig Harbor support group at Cottesmore. Couldn't make it? We hope to provide most of the presentation slides here at a later date. One final thank you to our sponsors, who made the day possible: Teva, EvergreenHealth, Paul & Debbi Brainerd, Virginia Mason, Fedelta and Medtronic. We are grateful to be part of such an amazing, involved community of people with Parkinson's, caregivers, spouses, family members and friends. Enjoy your week and be well.